Shhh… don’t tell Julia, Ms. Jeannie’s got another favorite French chef! Practically equivalent in the incredibly delicious food category, the culinary wonders of Jacques Pepin are a constant source of inspiration when it comes to time spent well in the kitchen. 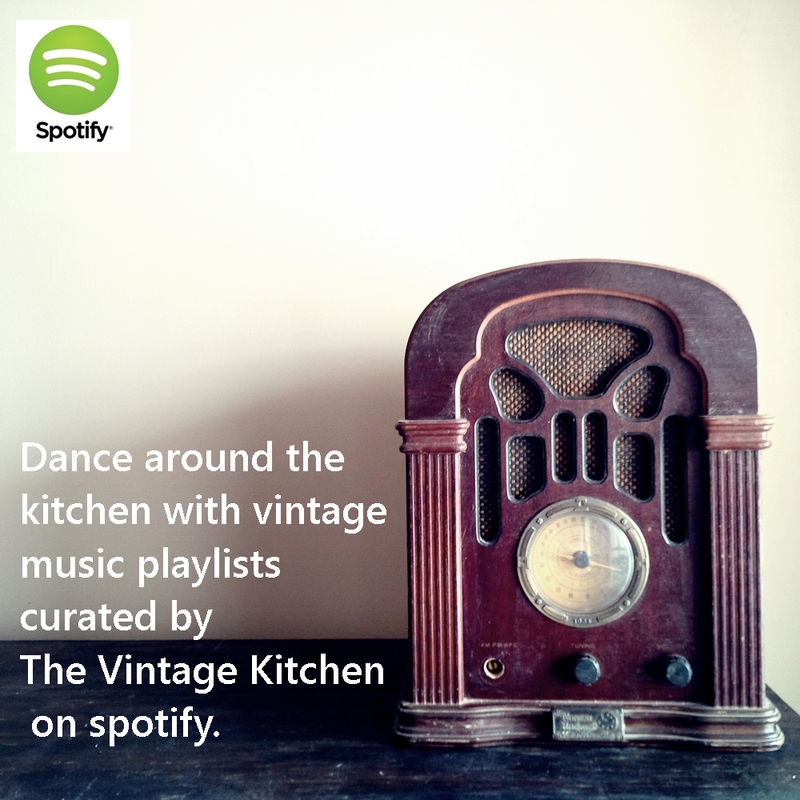 In a lot of ways he’s the opposite of Julia Child. She was an American that moved to France. He was a Frenchman that moved to America. 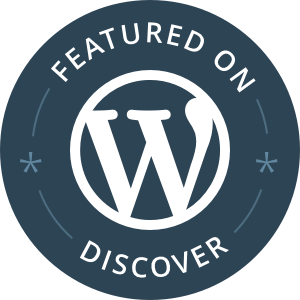 Julia learned the classics of French cooking, Jacques created original recipes. 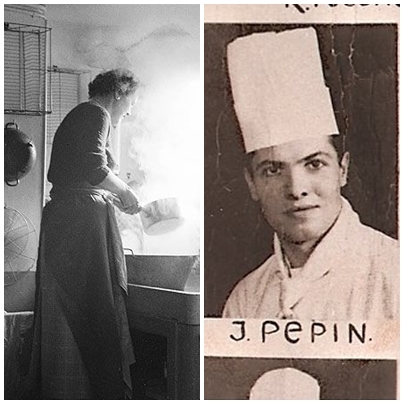 She developed her interest in cooking later in life while Jacques grew up in his family’s restaurant in Lyon. But for all their opposites they shared many things in common – their passion for food and fun being two. Claudine & Jacques in 1994. Like Julia, Jacques had his own cooking show on PBS which aired every Sunday afternoon in the late 1990’s. Jacques was not only fabulous in the kitchen but he was funny too! The whole precipice of the show was him trying to teach his adult daughter Claudine how to cook. Claudine was an everyman (everywoman?!) in the kitchen, and although she was the daughter of an FFC (famous French chef) she didn’t know much about cooking. For her, techniques were troublesome, flavor pairings were confusing and certain preparations were downright intimidating. 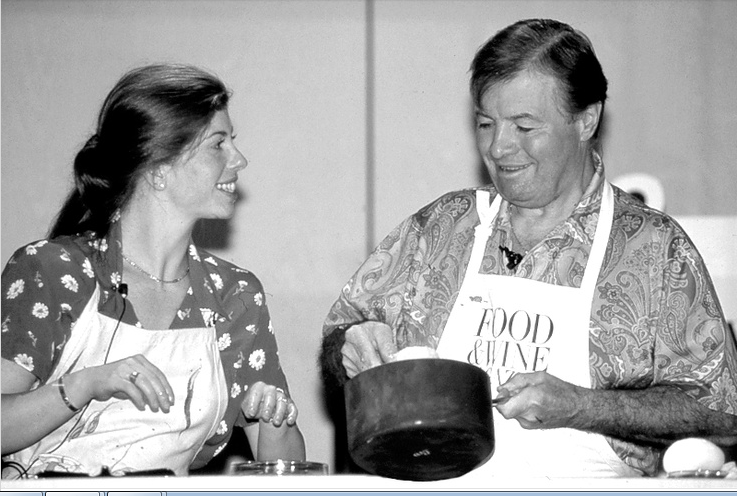 But In Cooking with Claudine, Jacques was there to teach and Claudine was there to learn, sort of. They were cute together. She’d make her own shortcuts, he’d quibble with her about the proper way to cut an onion or smash some garlic. Often times she’d humor him and then do it her own way. They laughed with each other and in the end they both learned from each other. Dad and daughter cooking up some fun. This camaraderie turned into quite a few television appearances over the years. If you are lucky you can still catch dad and daughter whipping up something delightful at a food festival or special event. Howard Johnson’s Motor Lodge and Restaurant circa 1960’s! Immersed in the everyday palate of the American culture, Jacques’ recipes pull from cultures around the world. They may have French foundations but they are built with a variety of different cuisines which make for unique arrangements in the flavor department. 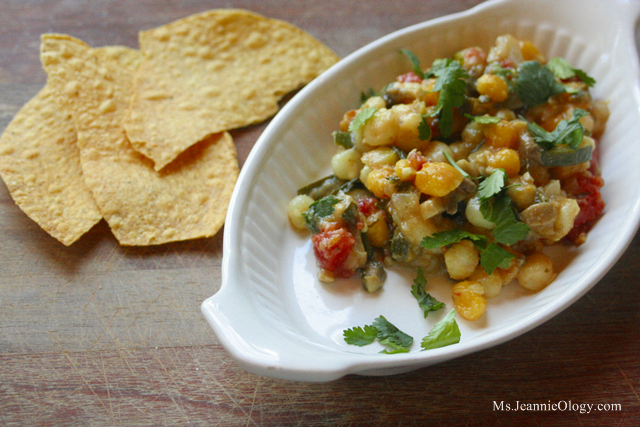 One recipe Ms. Jeannie tried recently featured an international concoction of ingredients. Pulling from Mexican, Mediterranean and Middle-Eastern staples, this springtime stew is perfect for the hot/cold/hot/cold temperatures of March. 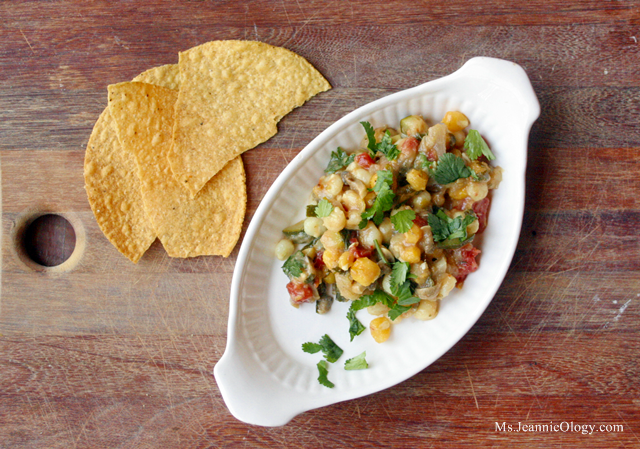 When the weather is as indecisive as your appetite and you can’t choose between something warm, light, fresh or substantial – Jacques’ Hominy, Cilantro and Cumin stew is the way too go. Hominy, thought Ms. Jeannie, was the same thing as as polenta which is the same thing as grits – a Southern staple here in the South. But not so, dear readers! Hominy is actually a corn kernel plumped up to the size of a chickpea and sold in cans not at all like its flour sacked cousins. A whole lesson was to be had at the grocery store. Polenta and grits are the same thing. Hominy is an entirely different matter altogether. Same family, different form. 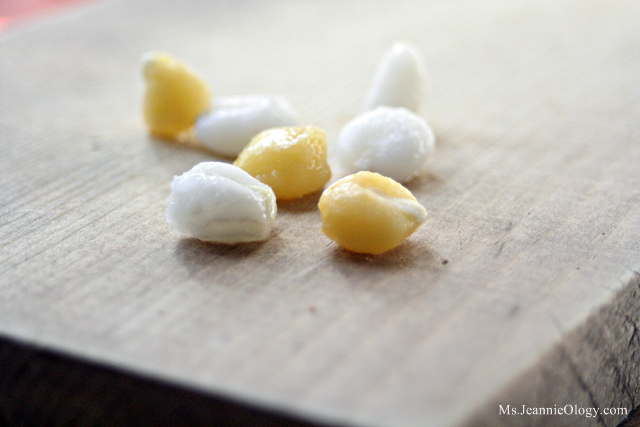 Hominy comes in two varieties – white and yellow. And as you can see from this picture – when compared to a popcorn kernal it is quite plump. The recipe calls for both colors which gives it an attractive color palette. Because of its distinct flavor, there is not a lot of variety when it comes to cooking with hominy. Ms. Jeannie was surprised to find just a few different types of recipes online. 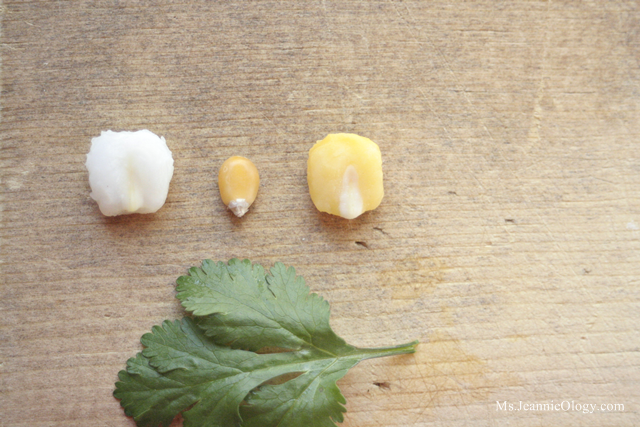 Jacques loves to cook with these little corn puffs, and now thanks to his delicious recipe, Ms. Jeannie does too! Heat the oil in a large pan. 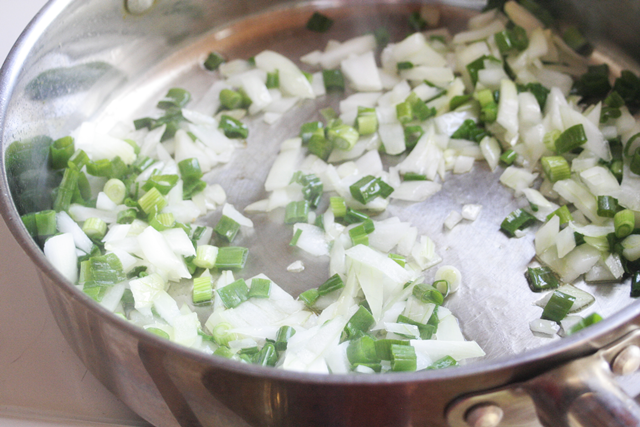 When it is hot, saute the onions and scallions for one minute. 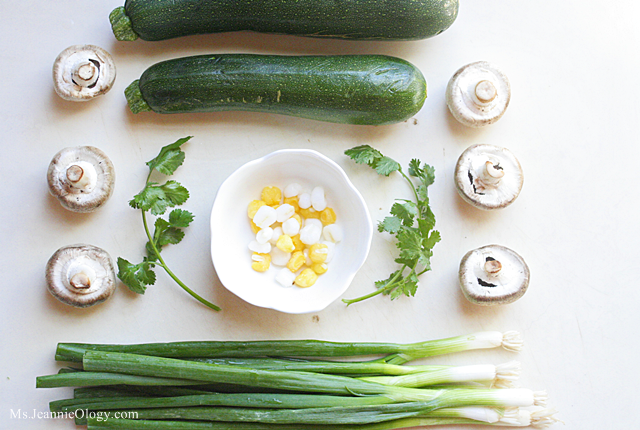 Then add zucchini, mushrooms, garlic, cumin and pepper flakes: cook for 3-4 minutes. 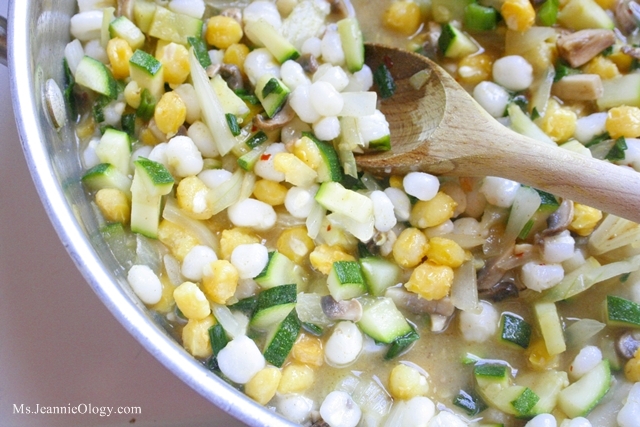 Add the hominy (with liquid from can) to the pan and bring mixture to a full boil. Reduce heat to low, cover and simmer for 10 minutes. Check the consistency after 10 – you don’t want it to be soupy, nor do you want it to be dry. If it is too liquidy – let it simmer until mixture is just moist. If it is too dry add a few tablespoons of water. Stir in tomatoes and cilantro, and let the mixture come to a boil again. Let it cook for one more minute before ladling into serving bowls. Jacques makes this as a side dish but you could also have it it on its own as a vegetarian lunch or dinner, which is what Ms. Jannie did here. Serving it with a few tostadas gives it a nice bit of crunch but also it would be great with poached chicken or a simple white fish. You could even serve it as a chunky dip for your Cinco de Mayo party! Happy hominy dear readers! If you have any great recipes featuring this flavorful fella please post it in the comments below. PS. 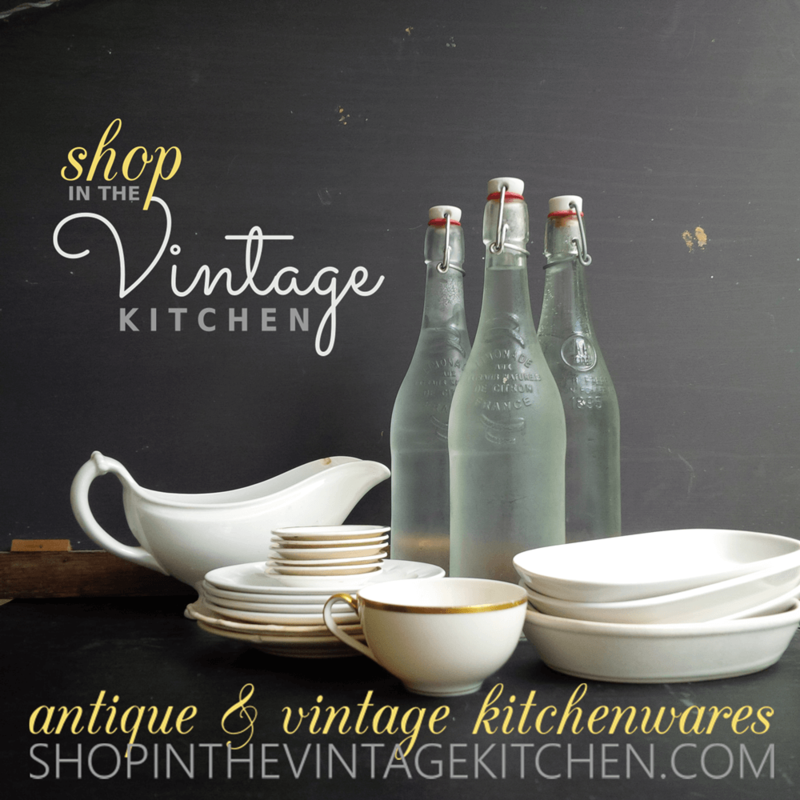 If you are loyal to Julia Child, Ms. Jeannie has one of her vintage cookbooks for sale in her shop. Click the photo for more info!